John Deere introduces the new diesel Z994R Commercial ZTrak™ zero-turn mower for more performance and efficiency in your fleet. Developed from extensive customer feedback, the new Z994R expands the John Deere portfolio of diesel solutions for professional landscape contractors. The Z994R offers enhanced comfort, increased productivity, lower operating costs and longer engine life. The Z994R is powered by a three-cylinder, liquid-cooled diesel engine with gross SAE J1995, PS 24.7 hp (18.4 kW) rated power at 3200 rpm that meets Final Tier 4 emission standards.The high-torque, low-emission diesel engine provides power for tough conditions with low vibration and noise levels. To increase productivity, the Z994R is equipped with a single 11.5-U.S. gal. (43.5-L) diesel fuel tank that provides enough fuel capacity for long mowing days with an easy-to-read fuel gauge. Operator comfort is a primary focus of the Z994R Diesel ZTrak mower, with three available seat options, each with adjustable armrests. All seat options also feature ComfortGlide™ fore/aft suspension that provides up to 2-in. (50.8 mm) of fore and aft travel to absorb bumps for enhanced ride quality. In addition, a large open operator station and foot platform with plenty of legroom, allows for multiple foot positions, and increased operator comfort. There are three mower deck options for the Z994R Diesel ZTrak mower. The 54-in. (137-cm) and 60-in. 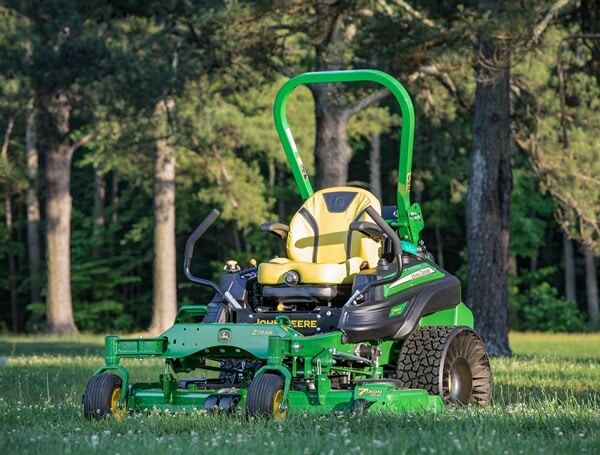 (152-cm) 7-Iron™ PRO side-discharge mower deck, and the 60-in. (152-cm) 7-Iron PRO Mulch On Demand™ mower deck that can easily change from side-discharge mode to fully chambered mulching mode with a single move of a lever. The new Z994R is also available with the MICHELIN® TWEEL® X® Turf airless radial tires to virtually eliminate flats and increase productivity.